You do everything you can to protect your basement from flooding – you keep your gutters and downspouts clear and you extended the downspout to keep the water as far from your foundation as possible. You’re fastidious about maintaining your weeping tiles (4″ drainage pipes that route excess water into the ground). Your landscaping is designed and maintained so water flows away from the house. But even with all these measures in place to keep your basement dry, you still need a sump pump, especially with fall and winter weather on the way. Heavy sustained rainfall and run-off from melting snow and ice can inundate the soil and overwhelm the external drainage system causing water to seep into your basement. When you protect your basement with a sump pump you also protect your health. A damp basement is a breeding ground for mould, which can be especially problematic for people with chronic respiratory issues. Sensitivity to mould can cause eye and skin irritation, sore throat, and difficulty breathing. 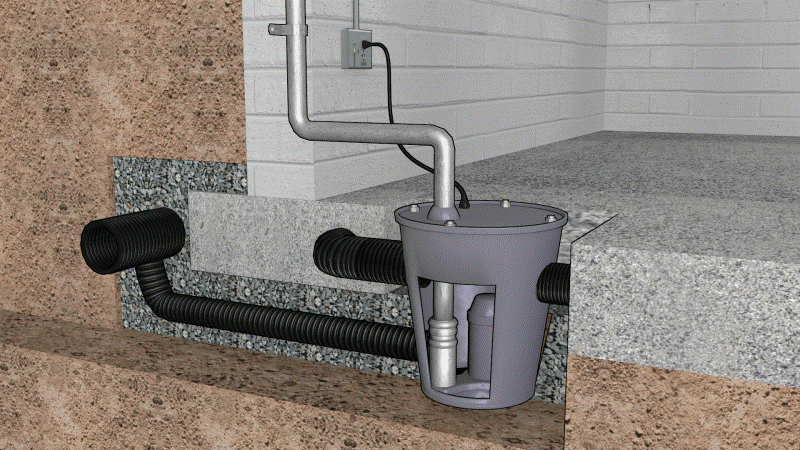 A sump pump protects your home’s health by preventing cracking of the walls and floors and keeps the house structurally sound by preventing soil erosion. In the Greater Toronto Area (GTA) the Toronto Flood Subsidy Program will help defray the cost of counter-flooding measures. Citizens of the GTA who don’t have a sump pump or one in need of repair should contact a licensed plumbing professional like Mister Plumber especially since, as mentioned, fall and winter weather is fast approaching. In 2013 Alberta experienced a severe flood and flooding is projected to become a greater issue for all of Canada in the coming years, so it pays to be proactive. A sump pump can also increase the value of your home. The cost of having a flooded basement professionally dried-out and repaired is determined by the extent of the damage and the size of the basement, but on the very low side, it could cost you $500. On the very high side, it could cost you $10.000 plus. In short, by keeping water out of your basement via a sump pump keeps money in your bank account. Also, homeowners who take proper flood precautions (i.e. ; having a sump pump) could get a break on their flood insurance premiums. There are two types of sump pumps: pedestal, and submersible. The pedestal is the cheaper of the two, and although it is effective, it may not be the best choice for areas prone to heavy flooding; it is also loud, because the motor is above the pump’s catch basin. The submersible is quieter because its motor is below the water line, and is more powerful so it can handle larger amounts of water than a pedestal sump pump. Consult a professional plumber to determine which type is right for you. In short, every home should have a sump pump. Not only does it keep harmful mould from growing in your basement, but it can also potentially save you a lot of money in damage. Contact a local, licensed plumber before fall and winter hit – they’ll definitely tell you the same.